Swanscombe marshes cover much of the Swanscombe Peninsula, a striking dorsal fin of land that sticks out into the Thames with Northfleet to the east and the QE2 Bridge to the west. The north side of the river is dominated by the industrial hubs of Grays and West Thurrock, to the south lies the A2 and beyond that a wealth of open, rolling arable land. It is a place hemmed in by developments of all sorts and yet somehow these features become distinctly remote when exploring this remarkable wild, open land in their midst. The marshes are broadly formed by three areas – Botany Marshes, Broadness Salt Marsh and Swanscombe Marshes (sometimes referred to as ‘Black Duck Marsh’). The landscape of Swanscombe marshes is open and low-lying with a variety of valuable established habitats distributed across it. An extensive reedbed comprises much of Black Duck Marsh, within it open channels and pools which support many species. Bordering this is a stand of woodland that holds a year-round herony. Broadness and Botany marshes consist of significant areas of wet grassland, reedbed and, at the former, notable areas of salt marsh, exposed mud and sheltered riparian habitats. The habitats at the centre of the site are influenced by the site’s industrial heritage which included a cement works and sewage facility along with numerous infrastructure features. These are now gone and in their place are large areas of bare, rocky, disturbed ground where nature has blossomed between the cracks. Hawthorn scrub, bramble and grasses dominate with numerous ditches and stagnant pools interspersed. The artificial ‘mound’ at the centre of the site is a good place to admire the landscape of the area. Looking south from here, beyond Ebbsfleet, is the shallow Springhead valley, an important wildlife corridor sculpted by a meandering river and home to cress beds and mature scrub margins. 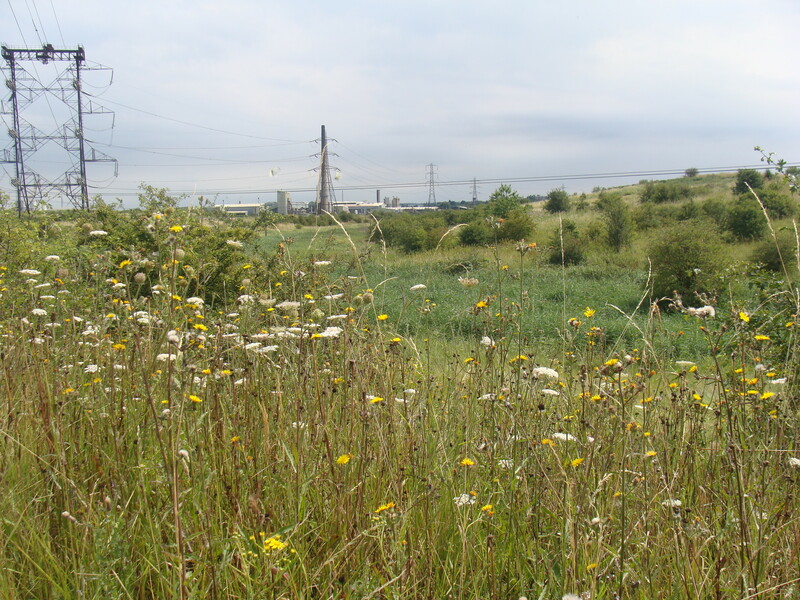 Undeveloped Brownfield habitats in the Thames corridor are renowned for their rich biodiversity, indeed an area at Canvey Wick just across the river has been described as ‘Britain’s Rainforest’ by the charity Buglife on account of its importance to wildlife – particularly invertebrates. Swanscombe Peninsula is little different. Surveys have found it to be one of only 2 known sites in the UK to support the rare Distinguished Jumping Spider. In addition to this are many nationally scarce and ‘red data book’ species. The site has a history of botanical interest. The endangered Water Vole is present at Swanscombe marshes, making great use of the ditches across the site. Amphibians recorded include Smooth Newt while reptiles such as Adder and Grass Snake have been seen. Swanscombe marshes is of huge importance to breeding and wintering birds. In spring and summer it is a great place to watch some of our most loved, and sadly declining, migrants. On bright days in May, cuckoos can be seen and heard across the marshes, while sand martins and swifts swoop over the pools. Birds of conservation concern such as Lapwing, Skylark, Linnet, Song Thrush and Starling can also be encountered. In winter, wildfowl such as Teal, Shoveler and Mallard congregate along the sheltered foreshore while it is one of the best sites in North Kent to encounter migrants such as Jack Snipe and Water Pipit. The majestic Marsh Harrier is now seen regularly, a bird that has bounced back from the brink in England – due in part to the availability of habitats like this. In 1991, an incredibly rare vagrant Bridled Tern was found close to Broadness Point – the first ever record for the Greater London area. The open landscape, quiet character and breadth of habitats make Swanscombe marshes a fascinating site for birdwatchers. For many of the reasons mentioned above, Swanscombe marshes in their current form are a site enjoyed by people. It is a valuable space for healthy leisure pursuits with joggers, walkers, cyclists and anglers all making use of the open, peaceful environment.